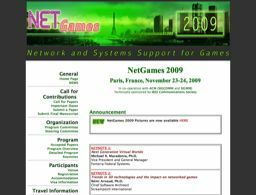 We would like to cordially invite you to attend the 8th Annual Workshop on Network and Systems Support for Games (NetGames 2009), which will be held on November 23-24, 2009 in Paris, France. The NetGames workshop is a major annual international workshop that brings together researchers and visionaries from academia, research labs, and industry to present new research in understanding networked games of today and in enabling the next generation of them. NetGames has become a recognized venue for promoting exciting discussions among its participants in all areas related to online games and Virtual environments. Two keynotes addresses, and a total of 18 research papers, posters and demos spanning various topics related to networked games will be presented and discussed. We cordially invite you to attend the workshop and share with us your feedback, thoughts, and experience.